Where there is a will, there is a way. This is one of the most commonly used phrase when we refer to something inspirational and want to carry on despite various hurdles coming our way. Similarly, when you are having problems such as shortage of time to visit the gym or only have different pairs of dumbbells available, worry not as we have tricks up our sleeves that be beneficial for your overall body workout. Before we begin to have a look at these exercises, one key note that should be pinned inside your brain is that to maximise your results, your food intake should be good and nutrient rich (especially with respect to protein content) and looking at your work hours, try to give your body the much required rest because overloading your body with workout and work can be troublesome, thus the balance. 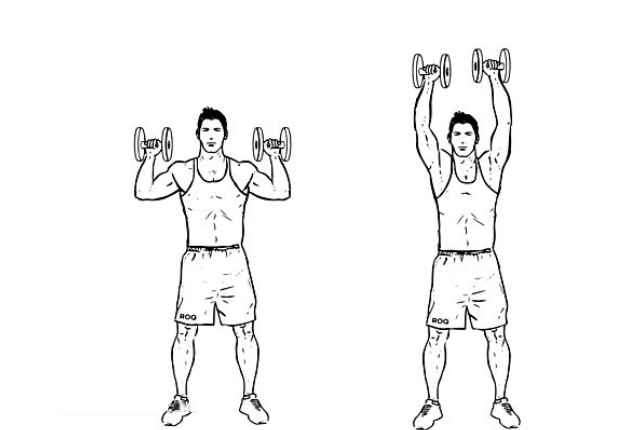 Stand with your feet in in line with your shoulders while holding the dumbbells in each hand. Keep bending your body in a chair position till your thighs are parallel to the ground. In case your feet start to shiver, you can bend forward to gain some more time but at the same time, avoid the knees clinging together as that would ruin the whole plan. This should be done in between 8-12 reps each within 2-4 sets. Begin with lying down at a supine (back touching the ground or face upward) position. 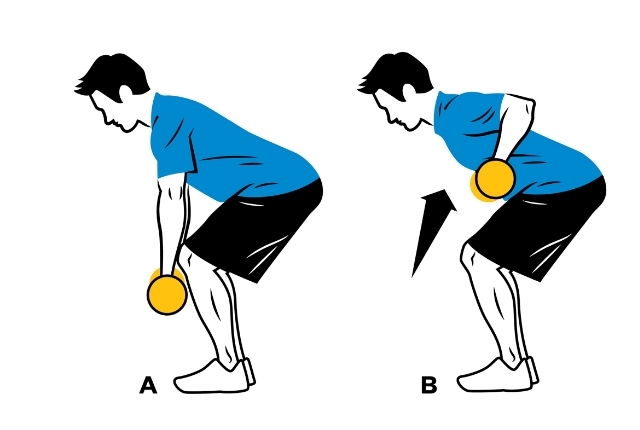 Now hold the dumbbells beside the shoulders with elbows bent and palms facing forward. Push the weights upwards and downwards keeping it at a same plane. Do not try to overdo it as it may cause problems in your back region. 2-4 sets of 8-12 reps is just what you need to get returns for your hard work. Stand up with your legs at a distance as that of your shoulders and at the same time holding the dumbbells. Now bend forward at the waist level by flexing your hip and amidst all this remember to keep your head and back straight. Lock your knees and tighten your buttocks once you go down and stop the exercise once you feel the full stretch of your hamstring (as this could lead hamstring damage). Carry on with 8-12 reps of the same in 2-4 sets to see the change. Stand straight with your feet in line with your shoulders while your knees are a little bent. Place the dumbbell on your shoulder with palms forward and slowly lift your arms till a point where your shoulder blades aren’t used. Begin again after slowly reaching down with your arms in the same position. Continue the exercise in the same numbers as of the previous exercise. Stand up in the same manner as described above with knees slightly bent. 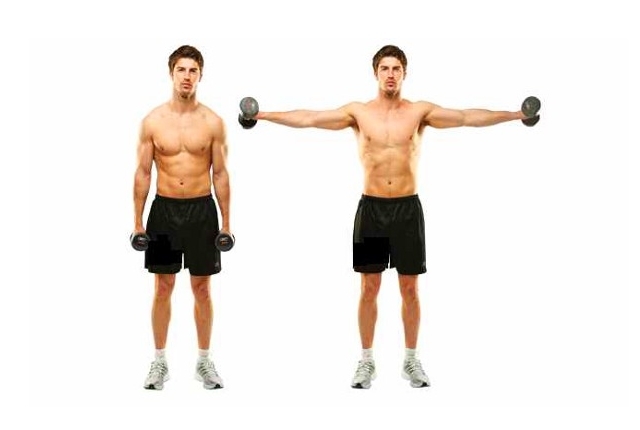 Hold the dumbbells facing each other in front of your body and begin with raising your arms sideways and should not be done once the arms come in a parallel position of the ground. Getting back to the beginning position may be a little tough as it has to be done slowly (because most of the workout takes place at this stage). 2-4 sets of 8-12 reps should be enough for effective results. Again, begin with the same position i.e. feet in line with the shoulders and knees slightly bent and at the same time, bend your upper torso in such a manner that it meets the 45-degree mark against the ground. 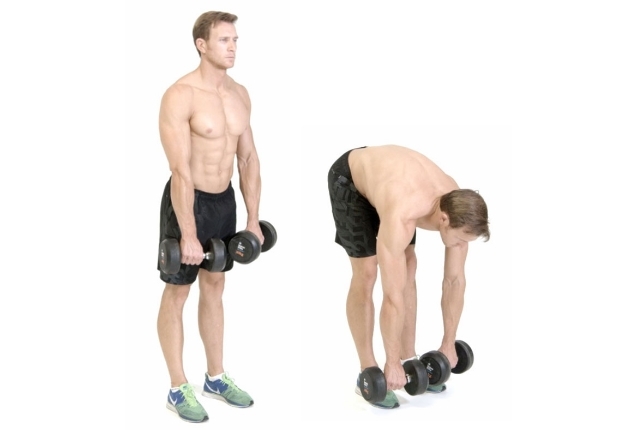 Now lift the dumbbells which have been kept facing each other in the initial position by bending your elbow and using your shoulder blades simultaneously. This is the best exercise one can do when looking for complete body workout by having only a pair of dumbbells available to him. Continue the same in 2-4 sets with 8-12 reps.
One of the few exercises in which you do not have to stand with your feet at shoulder distance and lying down for a change (but it doesn’t get easy). 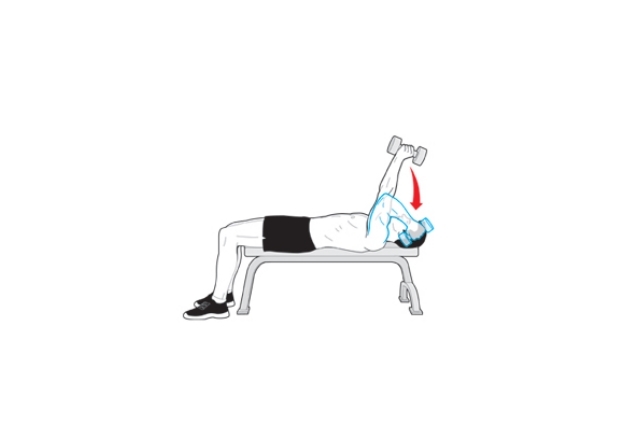 Lay down in a supine position and hold the dumbbells facing each other. Now the hands in this position are perpendicular to your body and the floor. Flex the elbows in such manner that it reaches the behind part of your ears without moving your shoulder joint or expressing its use to the minimum. 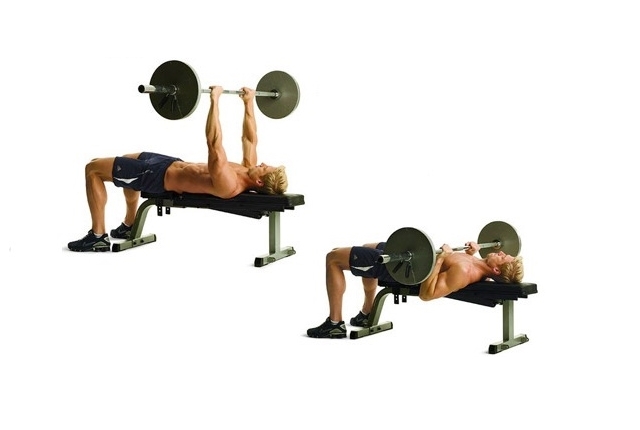 Now return slowly to the initial position and continue the same in reps of 12 reps in 1-3 sets.